More detailed driving directions are included with your confirmation and reminder emails. Our surf lessons are held at Ukumehame Beach Park, Mile Marker 12 on Highway 30. Meet at our white Toyota Tundra parked along guardrail on North side of Ukumehame Beach Park (see photo below). Our surf camps are located at Camp Olowalu , mile marker 15 on Highway 30. Please call us with any questions or for directions. *Phones are answered 7am-9pm HST. Next day reservations end at 5pm. Check our FAQ page for the most frequently asked questions. If the answer to your question can't be found there, please send us message using the contact form below. Let's Get You On A Board! 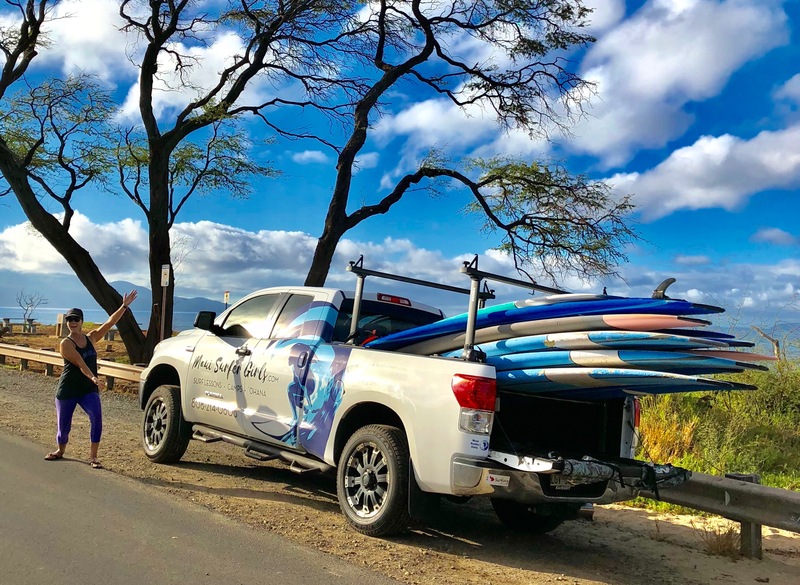 Contact Maui Surfer Girls today to get a surf lesson from one of our skilled coaches, signup for an overnight surf camp, or learn how to standup paddle board! Or just say 'Hi'.